Acute Respiratory Infections (ARI) account for an estimated 75% of all acute morbidities in industrialized countries and continue to be the leading cause of acute illness worldwide. The most serious and potentially life-threatening pneumopathies occur mainly in young children, the elderly, and immunocompromised or weakened individuals (such as those with chronic disease, cancer, or in intensive care units). The vast majority of respiratory illnesses are caused by bacteria and viruses. Since symptomatologies are similar, appropriate diagnostic testing is essential to identifying infectious agents. Optimized detection of infectious agents is necessary to ensure optimal patient management and to prevent the spread of infection. Parallel processing with the pathogens detected with the ARGENE® Respiratory range. 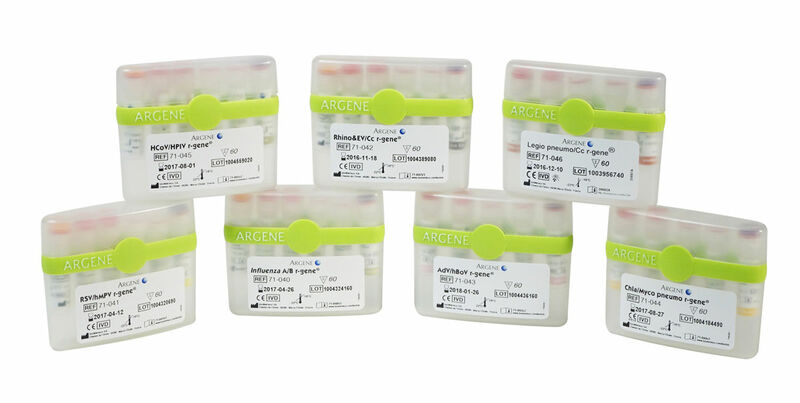 ARGENE® Respiratory kits are ready-to-use molecular kits for the detection of pathogens by real-time PCR after viral DNA & RNA extraction. This 5’ nuclease-based Taqman technology amplifies and simultaneously detects a specific region of the pathogen genome. Using ARGENE® Respiratory range of assays is straightforward and simple. Just add the extracted DNA or RNA sample to the ready-to-use PCR master mix chosen and start the reaction on the appropriate Real-Time PCR thermocycler, following optimized cycling program described in the “Instructions For Use”. BIOMERIEUX, the blue logo, ARGENE®, R-GENE®, EMAG® and NUCLISENS® easyMAG® are used, pending and/or registered trademarks belonging to bioMérieux, or one of its subsidiaries, or one of its companies. Any other name or trademark is the property of its respective owner. Principle of the test Duplex detection of both human Coronaviruses (NL63, OC43, HKU1, 229E) and Parainfluenza viruses (HPIV1, HPIV 2, HPIV 3, HPIV4). The vast majority of respiratory illnesses are caused by viruses and bacteria. In both children and adults, acute respiratory infections (ARI) are most frequently due to infections with Influenza A and B viruses, Parainfluenza viruses 1, 2 and 3, Respiratory Syncytial Virus (RSV A and B), Adenoviruses and Rhinoviruses. Others pathogens such as Coronaviruses, Bocaviruses, Enteroviruses, Parainfluenza 4, human Metapneumovirus, Mycoplasma pneumonia, Chlamydia pneumoniae, Legionella pneumophila, Bordetella pertussis and Bordetella parapertussis also infect the respiratory tract and can cause various diseases from mild self-limiting upper respiratory infections to potentially threatening pneumonia. Anyone can become infected and ill with these respiratory pathogens. However, young children, the elderly, immunocompromised or weakened individuals (including those with chronic disease, cancer, or in intensive care) are most likely to suffer serious and potentially life-threatening pneumopathies. What are the benefits of Respiratory pathogens molecular testing? Clinical symptoms for different respiratory illnesses are similar so in vitro diagnostic molecular methods are necessary to determine the causative agents. Early, rapid and specific detection of the virus or bacteria involved using real-time PCR methods is essential to provide patient-tailored therapy for better outcomes. An accurate diagnosis will also help to control outbreaks, reduce potential antibiotic resistance and facilitate a more rapid patient recovery. Infections respiratoires aigües : étude comparative des trousses d’amplification génique en temps réel respiratory multi well system r-gene de BioMérieux et Respiratory pathogens 21 de Fast Track diagnostics. Use of of Influenza Duplex PCR according Lean management to improve response to influenza pandemic and epidemic surge in a hospital virology department. Casalegno JS, Bouscambert M, Valette M, Billaud G, Emilie F, Escuret V, Mekki Y, Morfin F, Lina B.